Wifestyles Blog & Photography: MagnetStreet Sweepstakes! Friends, today is your lucky day!! My amazing sponsor MagnetStreet is hosting an outstanding sweepstakes! 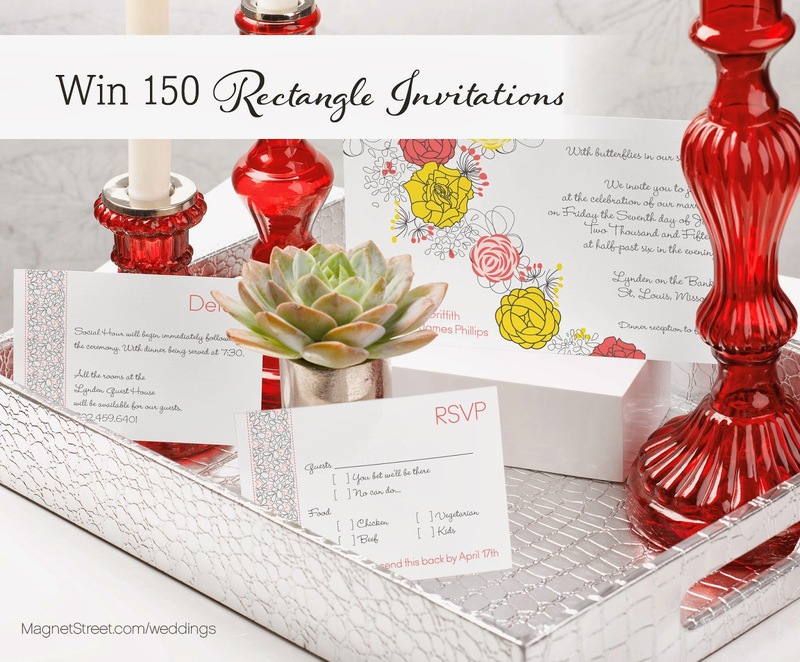 You can have the chance to win 150 Rectangle Invitations with coordinating Enclosure & RSVP Cards!! How amazing right?!! And every design can be easily personalized in YOUR colors! Anyone can enter and it's SUPER easy!! -To be eligible to win, participants must be 18 or older, live in Canada or the US, (They do not ship outside of those areas) and complete the entry form. -Sweepstakes ends 3/27, and 5 random winners will be contacted via email on 3/28. They'll also post a list of winners to their Facebook page on 3/28 after winners have been emailed. -One entry per Facebook user. So with all that said just click this LINK to enter!! Also, make sure to follow them on Twitter & Instagram! OMG looking at your blog + you look similar to Audrina Patridge! I think it just the big pretty teeth + long hair though. Everything else is different. But has anyone told you that before????? series, however with the release of volume 4, are they only now coming together. woolrich parka donna Sangue woolrich outlet online sputo economici, improvvisamente di nuovo a ridere lunghe giornate di sole, c'è un sogno segreto che non sai, ah ah ah, Lunghe giornate di sole, in questa vita è destinato ad essere un woolrich parka donna solitario, si muore si trova in questa vita infatti, tutti i viventi è così doloroso, ah ah ah, lunghe woolrich parka donna giornate di sole, mi. Sopracciglia outlet woolrich online economici più di un foro di proiettile, la mano di Long Tian Yang anche tenere le pistole, ma era tremando, si tratta di un tremore colpevole. Cheap sorrise e woolrich parka donna lentamente cadde all'indietro, perdendo la coscienza nel momento pensò a woolrich outlet italia buon mercato. Il mio woolrich parka donna cuore piangeva silenziosamente barche, dammi la vendetta.